High humidity is the most troublesome indoor air quality issue we face in Tampa. It makes the hot weather feel far worse because it traps heat inside our bodies—and this means keeping an AC running much more than it would otherwise. High humidity also leads to mold growth and water damage. We recommend working with us to have a whole-house humidifier installed into your HVAC system. This makes it easy for you to balance relative humidity at a comfortable 45%. The basic way to remove particles from the air circulating through your house is with filters placed into the ventilation system. Finding the right strength of filter is a job to leave to professionals, since going with a filter that is too powerful can damage the rest of your HVAC system. Often, air filters are paired with electronic air purifiers: if some pollutants can get through the fibers of the filter the purifier can stop them with ionization of oxidization power. The right air filtration and air purification combination can remove 99% of airborne pollutants. These devices help solve the problem of allowing a home to have better outdoor air ventilation without bringing in extra heat and making the AC work harder. An energy recovery ventilator (or ERV) uses a process called counterflow heat exchange to cool down a current of incoming fresh air using the cool air already in the home. This “recovers” the energy used to cool the air and applies it to the incoming air. An ERV works in the other direction as well, so when the weather is cooler, the outdoor air is pre-heated by the indoor air. 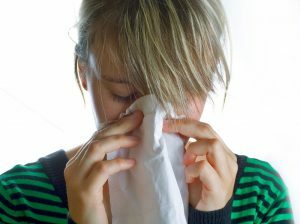 Sometimes, the reason for poor air quality and high humidity is damage to the ductwork connected to the AC. We can find out if this is a problem for your house, and the take care of the repairs to restore the ducts. You’ll not only have better air quality—you’ll prevent energy waste with the AC and heater. Look to us for great indoor air quality solutions. The A/C Guy of Tampa Bay Inc. serves our Tampa Bay family with integrity and honor.